The Milwaukee Bucks’ new ownership group publicly unveiled its vision to replace the BMO Harris Bradley Center with a futuristic new basketball arena to be built on more than 30 acres of vacant land just north of the current arena. An audacious two-phase project, which would begin with construction of the basketball arena, a parking structure and a practice facility for the Bucks ideally completed in time for the start of the 2017-18 season was unveiled at a press conference on April 8. 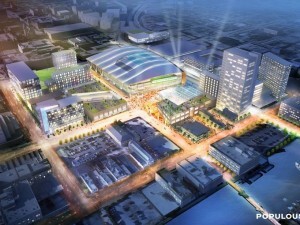 It was described as a $1 billion long-term investment in downtown Milwaukee. The lobby of the Bradley Center went suddenly quiet at around 10:30 a.m., as three large color posters were placed on easels stationed on a temporary platform. The posters showed renderings of the proposed arena as well as other ‘ancillary’ development which would be attracted to the area in part due to its proximity to the new arena. The three height perspectives were: street level, about three stories high and the last at about 1,000 feet. If completed as envisioned, the project would dramatically change the architectural character of the downtown Milwaukee skyline. Vowing to build a championship-contending National Basketball Association franchise, both on and off the court, Peter Feigin, president of the Milwaukee Bucks, spoke after reporters and guests had the opportunity to view and photograph the renderings. He said the ownership group was intent on creating a “ripple effect” of other development which would link with successful existing downtown development projects such as Schlitz Park and the former Pabst Brewery redevelopment project. Much of the land for the proposed arena is owned by the city and became vacant when the Park East Freeway was torn down in 2001. The Bradley Center opened in 1988. Only one other NBA franchise plays in an older un-renovated arena and the new ownership group has made a new arena a high priority. The proposed arena would include a swooping roofline and transparent glass exterior walls. 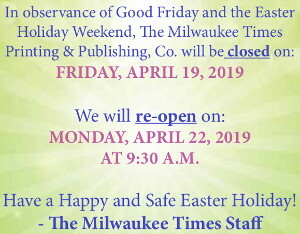 The main entrance would face east toward Lake Michigan, not unlike a bookend to the award-winning Milwaukee Art Museum. The arena would consist of about 700,000 square feet with seating for 17,000. It would also be a stop on the proposed trolley line, according to Michael Fascitelli, a successful Manhattan real estate developer who participated in the press conference and has become part of the Bucks ownership group. 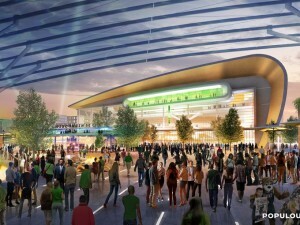 The arena design was produced by a team led by Kansas City-based Populous; the firm has designed 15 NBA or NHL arenas as well as three Olympic venues. The architectural team also includes the Milwaukee-based architecture firm Eppstein Uhen. Mr. Feigin said a team appointed by the ownership group traveled extensively during the past nine months, with particular interest in incorporating ideas from arena projects that spurred additional development. The representatives declined to be drawn into a discussion about who would pay for what proportion of the estimated $500 million cost of the arena project or how the other $500 million for phase two would be obtained. The proposed plan calls for closing off a portion of Fourth Street to create a pedestrian mall and to tear down the Bradley Center.